You’ve provided them with all the facts, the sources, the interpretations and now it is time to make sure it has all sunk in! While there are still opportunities to resolve any gaps in historical understanding, why not take advantage of these teacher-created and quality assured ideas from our GCSE revision collection? A collection of revision materials based around Nazi Germany but the format could be adapted for other topics. Includes, Battle Ships, Draughts (Checkers), and Ludo (Frustration). Great way to revise topics and gets students super engaged. A game based loosely on the board game. 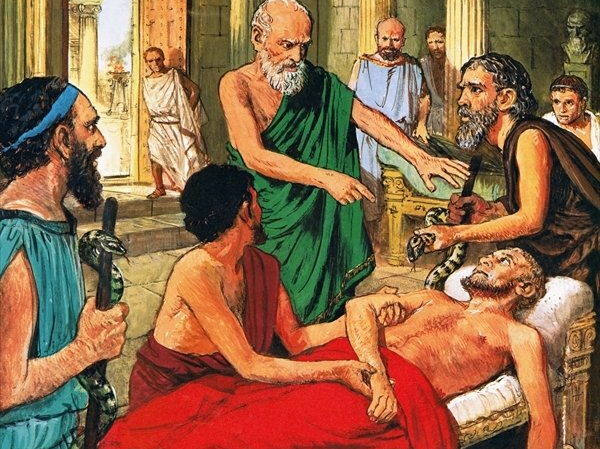 This activity is an engaging method of revisiting key elements of Medicine in the Ancient World. It comes complete with rules, guidance and easy to cut out currency. Prior to playing this game my own classes have completed a research project into the Ancient World either in class at the end of Year 9 or as a homework project prior to beginning their GCSE study of medicine through time. The project booklet is included in this package, though is available as a free resource from my resource list. 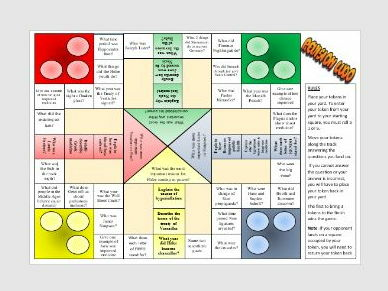 Classic Board Games adapted for revision of Cold War A-level (Superpower Relations) including who's who and Trivial Pursuit with adapted questions. I found an old version of trivial pursuit in a charity shop and printed the slides to fit the question cards and glued them on and laminated them. My classes play this as a revision activity. This is a simple game. Pick a category, answer the question and get that much prize money, if you get it right you pick the next category and value. I haven’t done true Jeopardy for any one familiar with the show, just questions and answers. It works really well with groups and buzzers. The slides are in colour and for some reason the preview doesn’t show them properly. It is all there though. I used somebody elses template from a medicine quiz and I thank them for making it as it saved me a lot of time. THe Q and A are all my own work. If you wish to share it please do, but please do so for free. Now with an instructions slide at the end. 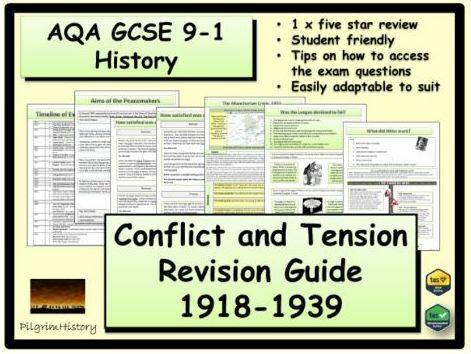 This is a revision guide tailored to the AQA Conflict and Tension 1918-1939 specification for the 9-1 GCSE. I have been inspired to write this as I have been disappointed that there has been so little out there and what there is tends to focus on content and not the new questions or the skills on how to answer them. Therefore this revision guide Includes practice questions throughout on the 4 main questions and gives examples of how to answer them in a simplified way. The information is also broken down into an easy to use format to aid the students in their revision programme. This Guide has been designed to be engaging, detailed and easy to follow and can be adapted and changed to suit. Any reviews on this resource would be much appreciated. If you like this Guide, please check out my others for AQA History on Germany 1890-1945, Britain: Health and the People c.1000 to the present day and Elizabethan England, c.1568-1603. An exam paper and model answers on the Superpower Relations and Cold War Edexcel 9-1 unit for history GCSE to help prepare students to access the higher GCSE grades. A practice mock exam paper that can be used for the new 9-1 exam. Also includes a powerpoint that can be used for a Walk-Through Mock with tips and hints on how to approach each question. 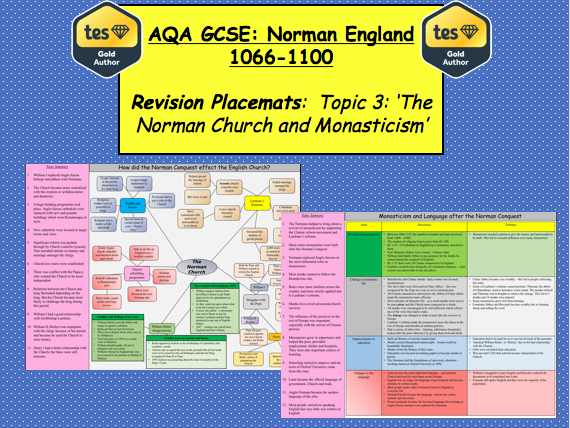 These interactive learning placemats were designed to meet the challenges of the new 9-1 GCSE. They build upon the successful Medicine Through Time Placemats that I previously designed (and which received 5* reviews by all who have purchased them up to the time of launching these new materials – see: https://www.tes.com/teaching-resource/9-1-edexcel-gcse-history-of-medicine-place-mat-question-structure-11627611 ). The new placemats have been identified as best practice during a ‘Challenge Partners’ review as well as being identified as best practice by other History teachers on the Olevi ‘Outstanding Teacher Programme’. The placemats are designed to be double sided. One side focuses on the CONTENT: providing an overview of key knowledge and understanding needed (this will change for each topic area within this GCSE unit). 2. Awareness of the ‘big picture’ so students can see how individual lessons fit into the unit and make clearer links between prior and future learning – through ‘Big Picture’ questions. 3. Better Literacy – through selected ‘language for learning’ vocab box. 4. Memory prompts to support revision – through the use of carefully selected images. 5. Increased awareness of metacognition – through PME (Progress, Monitor and Evaluation Time) questions to encourage students to deconstruct their learning and identify key factors (eg. Social, economic, political) or key individuals and make links between features. A pictorial metacognition man with 5 question prompts will support student reflection. 6. A confidence thermometer is also included as a prompt to identify student confidence in the topic. 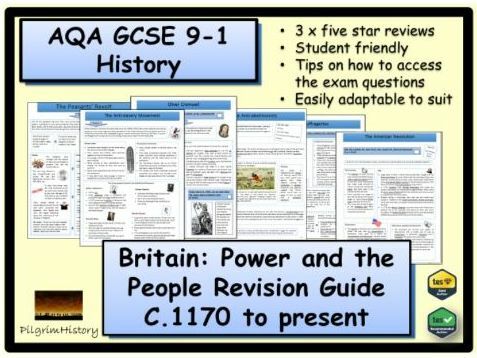 This 33 page revision guide covers AQA GCSE Britain: Power and the People, c.1170 to the present day. The Guide is broken down into four sections: challenging authority and feudalism, challenging royal authority, reform and reformers and equality and rights. The Guide starts by explaining the 4 questions types asked in the exam and gives suggestions and tips on the easiest way to tackle these. The Revision Guide gives over 20 typical exam questions asked on each topic (from significance, to how useful, to similarities and differences to factors) and how to put these questions into practice with model answers. This Guide has been designed to be engaging, detailed and easy to follow and can be adapted and changed to suit with PDF and word formats supplied. This Guide can be used for revision, interleaving, within the classroom as well for homework purposes. If you like this guide, please check out my others for AQA History on Germany 1890-1945, Conflict and Tension 1918-39 and Elizabeth. A detailed revision booklet with information, practice exam questions and model answers designed to help Edexcel 9-1 GCSE students achieve the highest grades on Paper 3 Weimar and Nazi Germany 1919-1939. Can be used for AQA, Edexcel, OCR or iGCSE exam boards. Part of Medieval 1750-1900 Medicine topic. A mix of revision tasks with powerpoint, worksheets, info and starter drill-test pack. Covers a range of 20th century topics. This product includes two complete lessons for the period 1500-1700, both lessons examine a 12 mark exam style question. The lessons allow students to work through a range of activities to develop their knowledge of the topic and form an opinion before completing the exam questions. The pack also includes a study guide for the unit c1000-c1500 (complete with exam skills) a quick fire test and answers and a self assessment matrix. Perfect for revision and exam preparation and developing the skill elements of the course. 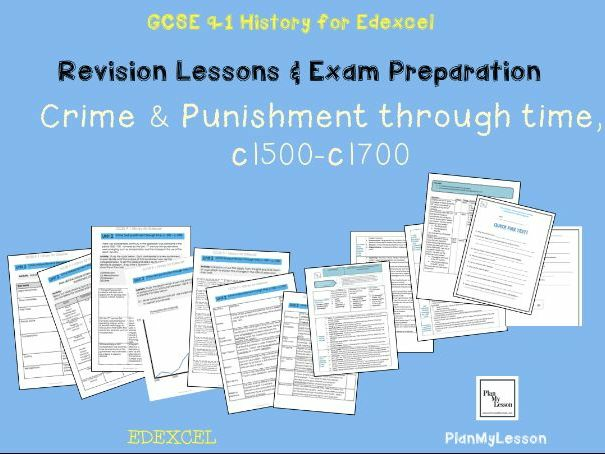 These lessons come from our Crime and Punishment Unit 2 Bundle, which can be found via the TES Planmylesson shop. Aimed for GCSE, this lesson is based around the concept of a revision clock, and is differentiated into 3 different ones, based on lower, mid and higher ability. Instructions are all in the presentation. 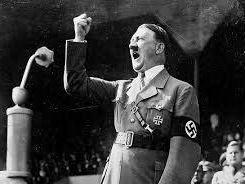 This presentation is based on Unit 1 Edexcel GCSE History The Weimar Republic. The main aim of this resource is to make the content of the course more visual, by adding pictures, photos, diagrams, maps, and video links, hence more accessible to all ability pupils. This resource can be used as a teaching resource, revision for students, or in Flipped Classroom style a pre teaching resource for students. 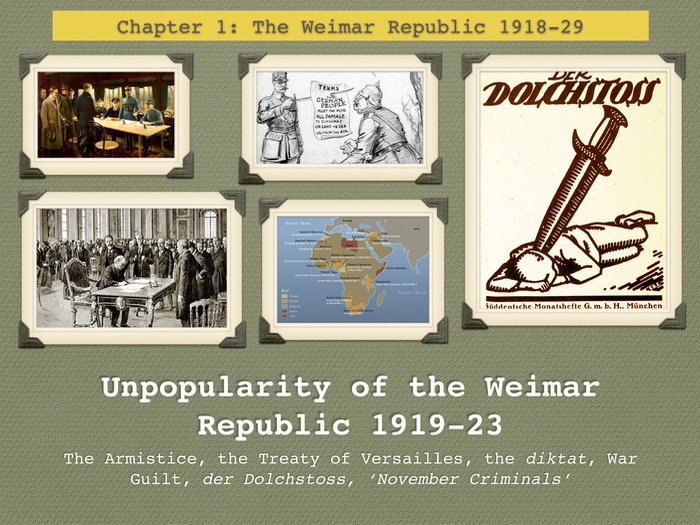 In this lesson we talk about the reasons behind the unpopularity of the Weimar Republic: the signing of the Armistce in 1918, then the unfortunate conditions of the Treaty of Versailles or the Diktat, War Guilt, and The-Stab-in-the-back myth, as well as the idea of November Criminals. Mindmap of all the Weimar Republic and Nazi Germany topics for GCSE, including pointers to key questions for each sub-topic. Created originally for EdExcel iGCSE Development of Germany, but equally applicable for AQA / OCR / SHP Depth Studies with a little tweaking. Handy for planning or revision to make sure all areas covered. Evidence Usefulness Mat KS3/KS4 Edexcel 1-9 Source based questions. This sheet is to be given to help students in KS3/4 who will be going on to take the Edexcel GCSE 1-9. 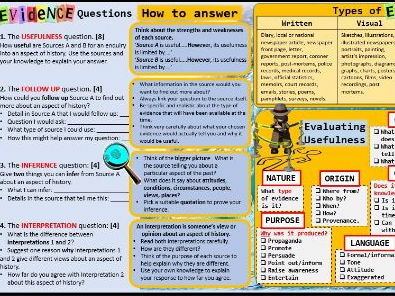 It includes a 'how to' section for the 4 source type questions the students will have at GCSE, types of evidence and how to evaluate the usefulness of evidence. Along with a collection of key terms the students can use to help develop their answers. This is specifically for the new Edexcel GCSE and for KS3 students to start developing these source skills early. (The reverse side of the placemat remains the same throughout this study unit). Awareness of the ‘big picture’ so students can see how individual lessons fit into the unit and make clearer links between prior and future learning – through ‘Big Picture’ questions. Better Literacy – through selected ‘language for learning’ vocab box. Memory prompts to support revision – through the use of carefully selected images. Increased awareness of metacognition – through PME (Progress, Monitor and Evaluation Time) questions to encourage students to deconstruct their learning and identify key factors (eg. Social, economic, political) or key individuals and make links between features. A pictorial metacognition man with 5 question prompts will support student reflection. •	How did the Norman Conquest affect the English Church? These are great for last minute revision or to put on a ‘google classroom’ for all students to look at on their home computers.